But while the risk of a wholesale downgrade of the investment grade market is increasingly being priced in by the market - even if the timing remains suspect and might even be postponed if the Fed were to cut rates in 2019 as JPM observed overnight when noting the inversion in the front-end (2Y-1Y forwards spreads) of the US curve, a new big concern for the credit market is emerging, and here the timing of the imminent threat is all too urgent. Because while some may be tempted to ignore the BBB downgrade "wall of worry", corporate America is now facing a "maturity tsunami of worry" that is some 1.6 trillion dollars high. 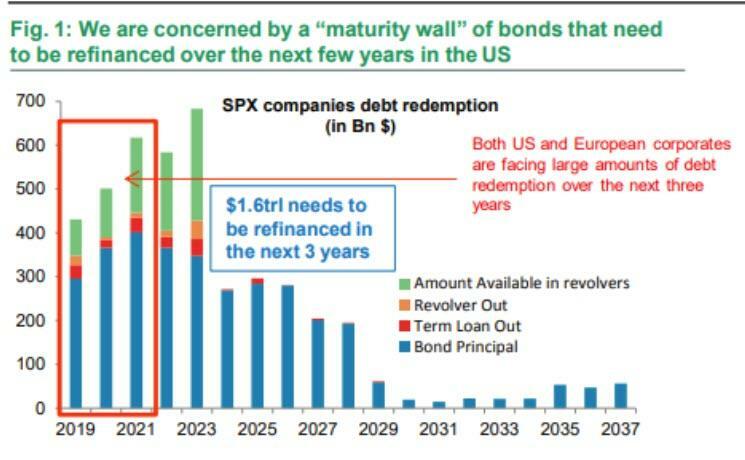 As the following chart from BNP Paribas shows, a wall of maturing debt is about to slam head on into S&P 500 companies. Commenting on the chart, BNP understandable writes that it is "concerned by the maturity wall of bonds that need to be refinance over the next few years." And, as Bloomberg's Sebastian Boyd observes, said maturity wall is made even scarier by adding the amount available in untapped revolvers, which is money that in theory doesn't need to be paid back and splits the counterparty risk with the company's bank lenders (see GE). More than a wall, the debt coming due is a wave that has been building for a decade. Or, as we called it above, a tsunami, which will hit both viable and "zombie" companies with billions in higher interest expense costs once the wave finally breaks, some time in 2019. That said, nothing shown in the chart above should come as a surprise as the amount of newly issued debt (and also debt coming due) has been growing at an exponential rate over the past decade. Indeed, a historical chart looks truly impressive - or terrifying - considering that the amount of investment-grade bonds coming due in 1-3 years in June 2007 was only $360 million. Back then the spread on the overall index was in the mid-90s, roughly where it was in the first months of this year. However, as Boyd notes, the market cap of the Bloomberg Barclays 1-3 Year Credit index reached a record high of $1.4 trillion at the end of September, or roughly three times what it was before the crisis. 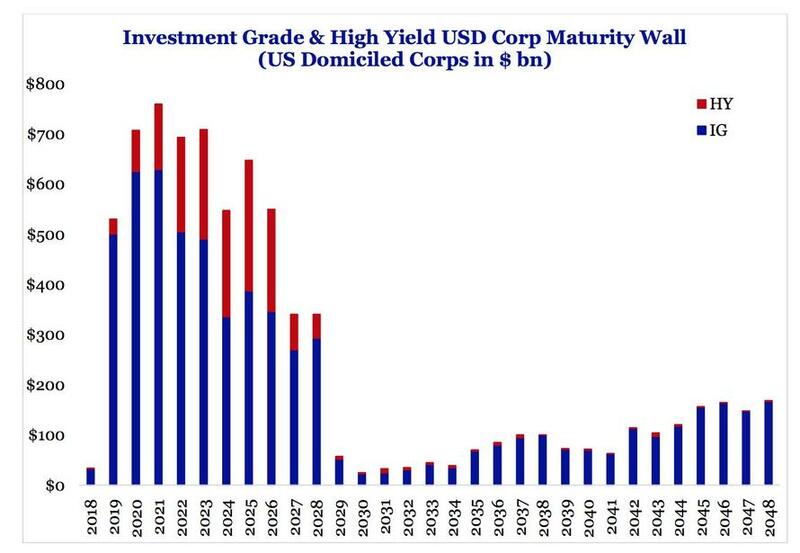 Finally, just as troubling is this chart from SRP which in addition to IG, also incorporates the amount of junk bond maturities in the coming decade. Needless to say, as trillions in debt mature over the next several years and have to be rolled over into debt with far higher yields and cash coupons, corporations will be saddled with tens of billions in additional annual interest expense costs, money which CEOs and CFOs would have otherwise used to fund stock buybacks.